The job of servicing and repairing life support equipment is a vital part of the diving industry. This profession requires a commitment to constant education in order to keep pace with the development of new products. Formerly known as Peter Built Co., Scuba Tools has a history of providing the best scuba test equipment, tools and manuals in the business. 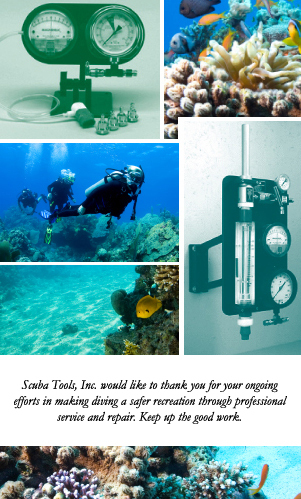 At Scuba Tools, Inc., we are dedicated to producing the highest quality specialized tools and scuba test equipment to make the day-to-day work in your scuba service center more efficient and less frustrating. Having the right tool for the job saves time and allows the professional technician to concentrate on doing the job right. Eighty percent of our tools are designed, manufactured, and assembled in house from raw materials to finished product. The advantage of "full scope manufacturing" is that it gives us complete control over the final product, and helps to justify the added expense of short run production. The results are consistently high quality tools and reasonable prices. 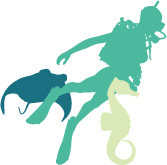 Our customers range from the largest diving equipment manufacturers to individual scuba repair technicians worldwide. Whether you’re in need of custom scuba tools, scuba testing equipment, or regulator repair tools, you can trust Scuba Tools to provide competitively priced, top notch tools for all of your diving equipment repair needs. personally during normal business hours. Our fax line and web site are open 24 hours a day, 7 days a week.